Prepare for the next level of RC play with authentic, true-to-movie battle action in this Ultimate Justice League Batmobile! The 1/10 scale vehicle's cockpit has a built-in camera that transmits the driver's POV to a smart phone for a thrilling, front seat ride! 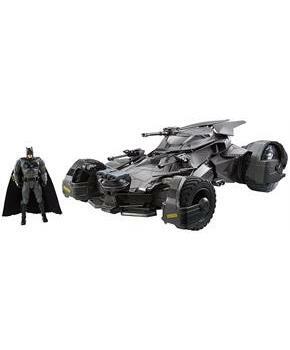 Place the highly detailed, new movie Batman action figure behind the wheel and speed to the crime scene. The figure's arm turns the wheel as the powerful Batmobile races at top velocity! See smoke release from the tailpipe and the engine roar! When DC Super-Villains are in range, engage the special "jump mode" and elevate the Batmobile for prime targeting. Fire the four missiles from the hood of the car and save Gotham City! Get all-terrain drive with hydraulics performance, and go the distance with Wi-Fi connectivity that allows live-action streaming video, and a range of up to 65 feet! One Lithium ion battery required (included).